United Nations (United States) (AFP) - Hours after striking Syria, the United States, France and Britain on Saturday launched a new bid at the United Nations to investigate chemical weapons attacks in Syria. The three allies circulated a joint draft resolution at the Security Council that also calls for unimpeded deliveries of humanitarian aid, enforcing a ceasefire and demands that Syria engage in UN-led peace talks, according to the text obtained by AFP. The move signaled the West's resolve to return to diplomacy after a one-night military operation that hit sites Western officials said were linked to Syria's chemical weapons program. The measure would instruct the Organisation for the Prohibition of Chemical Weapons (OPCW) to report within 30 days on whether Syria has fully disclosed its chemical weapons stockpile. The West has accused Syria of failing to live up to its commitment to scrap its chemical weapons program, under a 2013 deal reached between the United States and Russia. The text calls for a ceasefire resolution adopted in February but which never materialized to finally take hold and "demands" that President Bashar al-Assad's government engage in peace talks "in good faith, constructively and without preconditions." Several rounds of peace talks held under UN auspices in Geneva have failed to yield progress, deadlocked over demands that Assad make way for a political transition. Negotiations on the draft resolution are set to begin on Monday, but diplomats said it remained unclear when the council would vote on the proposal. Western diplomats said they were ready to allow time for negotiations to make every effort to bring Russia aboard. Russia has used its veto 12 times at the Security Council to block action targeting its Syrian ally. The new diplomatic push came after a stormy Security Council meeting called by Russia, which branded the military action an "aggression" against Syria and sought condemnation. That bid however failed, with only China and Bolivia voting alongside Russia to condemn the air strikes. Eight countries opposed condemnation while four abstained. 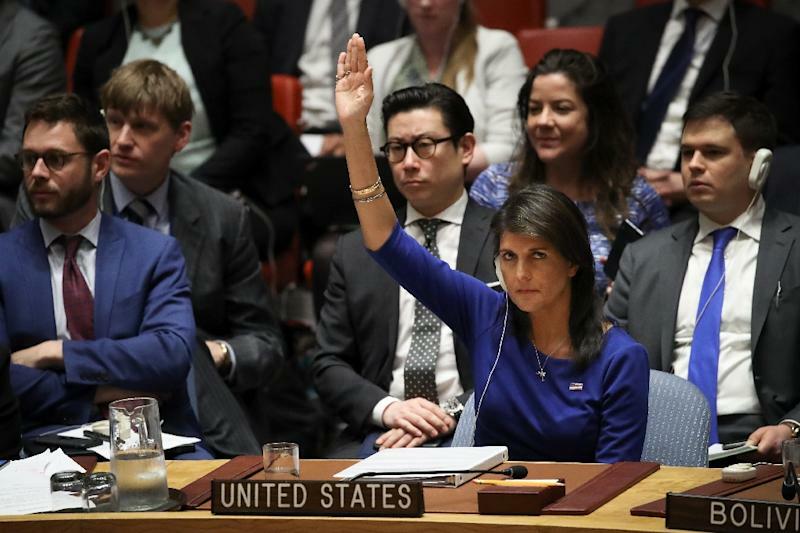 Addressing the council, US Ambassador Nikki Haley said the United States was confident that the military strikes had crippled Syria's chemical weapons program. Haley warned that the United States was "locked and loaded," ready to strike again if any new chemical attack was carried out in Syria. Russian Ambassador Vassily Nebenzia accused the West of "hooliganism" and demanded that it "immediately end its actions against Syria and refrain from them in the future." "You are not only placing yourselves above international law, but you are trying to re-write international law," Nebenzia said. The United States, Britain and France launched air strikes in response to a suspected chemical attack in the rebel-held town of Douma a week ago that killed at least 40 people. The council has met five times this week on Syria amid repeated pleas from UN Secretary-General Antonio Guterres to end divisions over Syria.